Situla art developed as an echo of the toreutic style which had spread from the Near East through the Phoenicians, Greeks and Etruscans as far as the Veneti, Raeti, Histri, and their eastern neighbours in the region of Dolenjska (Lower Carniola). An Early Iron Age phenomenon (c. 600—300 BC), it rep- resents the major and most arresting form of the contemporary visual arts in an area stretching from the foot of the Apennines in the south to the Drava and Sava rivers in the east. Indeed, individual pieces have found their way across the Alpine passes and all the way north to the Danube. In the world and art of the situlae, a prominent role is accorded to ani- mals. They are displayed in numerous representations of human activities on artefacts crafted in the classic situla style – that is, between the late 6th and early 5th centuries BC – as passive participants (e.g. in pageants or in harness) or as an active element of the situla narrative. The most typical example of the latter is the hunting scene. Today we know at least four objects decorat- ed exclusively with hunting themes, and a number of situlae and other larger vessels where hunting scenes are embedded in composite narratives. All this suggests a popularity unparallelled by any other genre. Clearly recognisable are various hunting techniques and weapons, each associated with a particu- lar type of game (Fig. 1). The chase of a stag with javelin, horse and hound is depicted on the long- familiar and repeatedly published fibula of Zagorje (Fig. 2). It displays a hound mauling the stag’s back and a hunter on horseback pursuing a hind, her neck already pierced by the javelin. To judge by the (so far unnoticed) shaft end un- der the stag’s muzzle, the hunter would have been brandishing a second jave- lin as well, like the warrior of the Vače fibula or the rider of the Nesactium situla, presumably himself a hunter. Many parallels to his motif are known from Greece, Etruria, and prehistory (Fig. 3). The most popular hunting technique is stag-stalking with bow and hound. Made famous by the Molnik fibula and represented on several situlae, it is a typical genre scene: the hunter, standing or kneeling behind a tree with his hound, is aiming his bow at a couple of grazing animals, evidently symbols of the herd. In the context of stag-stalking scenes, two probable misinterpreta- tions should be pointed out: rather than the tip of a rabbit’s ear, the triangular finish of the missing element from the Dürrnberg cup may be the extreme end of either the barb of a bilobate arrow (Fig. 4). And, secondly, the situla from the Kapiteljska njiva at Novo Mesto displays no tethered young stag but an adult animal next to a roughly crafted palmette (Fig. 6). The hunter (with hound) ly- ing in wait is a highly popular motif in different cultures: these scenes evince strong similarities in terms of date and composition (Fig. 5). Preložnik, Andrej. 2013. “Hunting Motifs in Situla Art”. 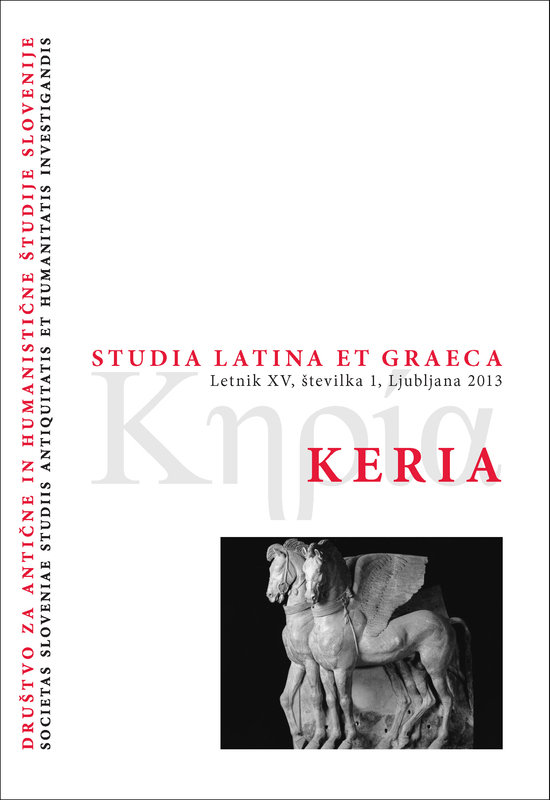 Keria: Studia Latina Et Graeca 15 (1), 19-34. https://doi.org/10.4312/keria.15.1.19-34.